The BASTUO storage organizer is made of eco-friendly PP panel, ABS connector and rustproof steel frame, it's can store your books, cloth and shoes,etc. The DIY design provides you with a lot of imagination, this organizer can be assembled different style you need. - Material:PP panels, ABS connectors. - Please make sure that all panels are inserted into the slot during installation, and there is no gap between them. PREMIUM DESIGN:It's made of PP panels, ABS connectors and steel frame. The 12-cube plastic storage cabinet is safe for your house. 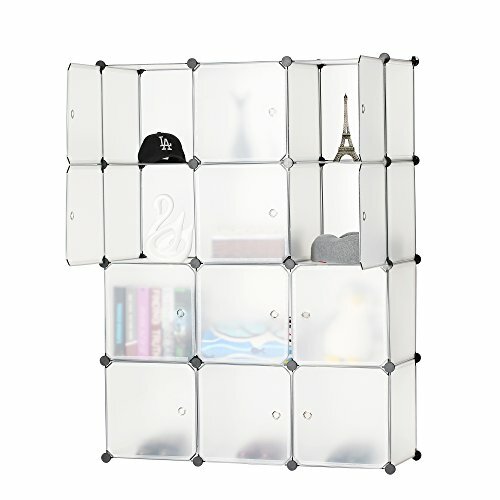 DIY STORAGE CUBE:It's can be assembled into different styles, fit into the limited space of your room. MULTIPURPOSE STORAGE ORGANIZER:It's can store many things, for your clothes, shoes, books, children toys etc. STURDY FRAME:The storage shelf is supported by steel frame and PP panel. Each panel can weight up to 10lbs. PRODUCT SIZE:43.3"L X 14.57"W X 57"H(110 X 37 X 145cm), each panel size:13.78" X 13.78" X 13.78"(35 X 35 X 35CM), it's easy to assemble with PP panels and ABS connectors.